Harlaxton House is a single story house constructed of red stone quarried from Harlaxton. The original architect who designed the house is unknown, although construction was completed in approximately 1870, and is of Victorian Gregorian style architecture. Built as the primary residence of Australian explorer and politician Francis Thomas Gregory and his wife, the house was also rented to governor of Queensland Lord Lamington, purportedly where the lamington cake was invented. The building is not used specifically for any particular purpose at this point in time. Vacy Hall was designed by James Marks and built by Alexander Mays in 1899. Many characteristics of the building make it unique and and give it an overall significance including it's location, 'L' shaped design, a gable, led light entrance, encircling verandah, substantial English garden, gravel entrance drive way and more. Today, the building is predominantly used for guest accommodation. Unveiled by Queensland Governor Sir Matthew Nathan in 1922 after the mothers of soldiers from Toowoomba and surrounding districts who did not return from WWI decided to fund and build the memorial in honour of their sons. Sweet violets which would eventually become known as the Toowoomba Violet and be adopted as Toowoomba's floral emblem were sold in 1914 to raise funds to build the memorial, . Originally located at the intersection of the cities main intersection of Ruthven and Margaret St, the eight metre high memorial was relocated and re-dedicated to its current location at East Creek Park on the 10th November 1985 due to traffic congestion. ANZAC day commemorations have taken place at the memorials location since 1916. St. Patrick's Cathedral Toowoomba is named after Pātricius, a missionary born in Roman-Britan in the later part of the fourth century, and passed away on March 17, 460AD. Originally designed by architect James Marks. It is based on a Neo-Gothic design and is made of bluestone. Replacing two prior churches made of timber on the same location years earlier, the foundation stone for the present day St Pat's building was laid in 1883. Once construction was completed, the church was officially opened on St. Pat's day in 1889. Further expansions to the cathedral commenced in 1929 and completed in 1935. Extensive renovations were undertaken in 1972. 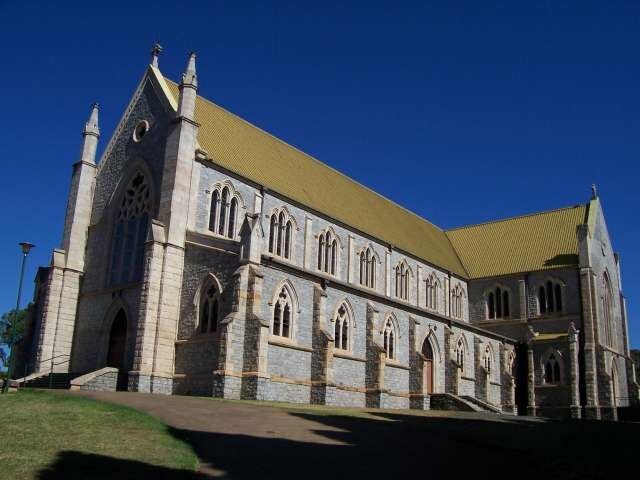 The church celebrated its centenary in 1989 and as part of the commemorations a new bell tower was constructed. The cathedral is listed on the Queensland Heritage Register as at the 21/10/1992.